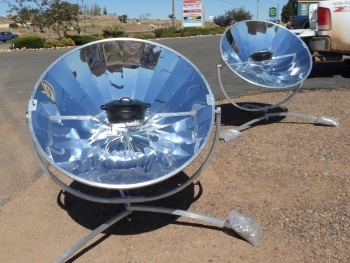 Sun Chef Cooker is a parabolic style cooker produced by Ray Williams in Southern Arizona. The company was purchased in the last few years as a total re-build was proposed by Ray. Keep an eye on his website as he makes additions to his offerings and hopes to improve the Sun Chef Cooker with a "next generation" coming soon. 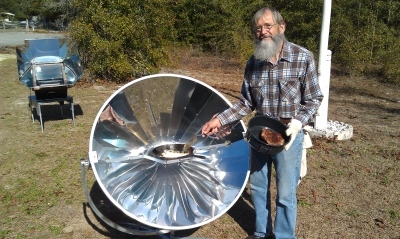 Ray also plans to rebuild a number of solar cookers. We are excited for his progress and look forward to seeing good things coming from him in the coming years! 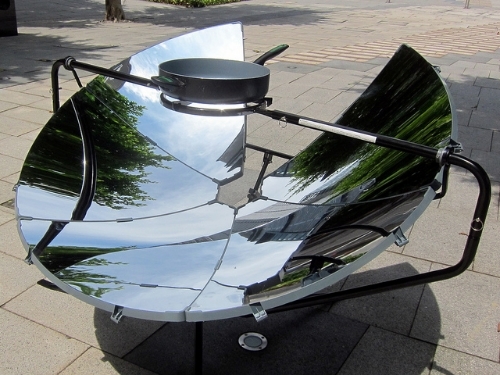 This Solar Parabolic Cooker is a medium quality, medium output parabolic solar cooker that should give years of effective and energy saving grilling, boiling, frying and all around good solar cooking enjoyment. The Sun Chef Cooker is manufactured using high quality, durable, rugged and weather resistant materials allowing for many years of productive use. Three feet six inches- 3'6"
Assembled Height 57" Width 52"
Special Features: Wide Tripod Adjustable Base: Allowing for more level and secure setup. Availability: The Sun Chef Cooker is assembled in the United States and can be shipped to most locations within the US. 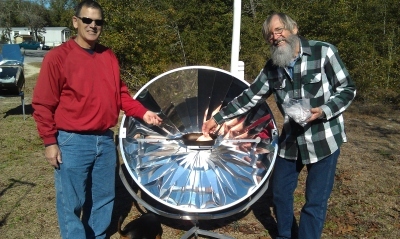 The Sun Chef Solar Cooker is currently out of production as Ray Williams is planning to fix a number of issues with the cooker when he introduces his new Generation II Solar Chef Parabolic. Takes a little more time to assemble but once assembled, you can leave it assembled. Its weight is less than some standard parabolas giving it a slight disadvantage against heavier breezes. Cooking can be a challenge on windy days. 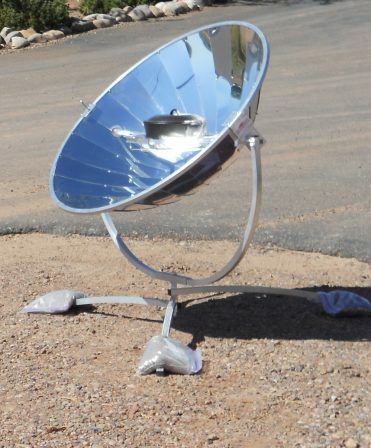 One of the more expensive solar parabolic cookers, mainly due to the quality of materials used in its construction. This parabolic is not compact or portable but it can be partially disassembled for limited transport and storage. Cantina West offers the only protection available on the market today with our military strength protective cover! Make sure to add a cover to your cart when purchasing any of the parabolic solar cookers we offer and keep your parabolic in top shape for years to come. This cover is made of 500 Denier military fabric and manufactured right here in the USA from start to finish! Customer submitted photos of the Sun Chef in action!